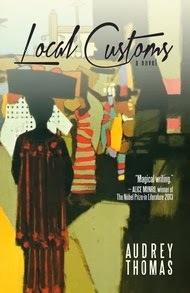 From Inner to Outer: Digression: Books I'm Reviewing—Audrey Thomas' "Local Customs"
Digression: Books I'm Reviewing—Audrey Thomas' "Local Customs"
There's fiction that you read and all the while understand that thematically or stylistically it belongs to a current fashion or literary norm. Narrated by a series of talkative and quarrelsome spectres, Local Customs appears to stand well outside convention as it presents a series of biased and partial accounts of the life of Letitia Elizabeth Landon, a real-life English poet who died in western Africa in 1838. Economical, funny, and decidedly odd, Thomas' novel crackles with personality even as it's suffused with Gothic atmospherics.